At last! Back in the woods on 4 wheels. Well it does look like it may have been a daft lad’s toy once over, but the front flood lights and rear work lights will definitely be useful. I’ve already used the work light 4 times in two days! Great for unloading logs and fixing the trailer wheel lock, which I haven’t yet quite got the hang of and seems to take ages, but worth it. Now I know there are people on the prowl at night I’m not taking any chances. The big tyres seem to throw a lot of mud up, but they should be good when I start felling again and get into the thick of it a bit. The chap (yes he of the traction engine and steam roller, acquaintance of Fred Dibner’s) at Jake Wright’s where I bought it thought the bull bars might be good in the woods too, the front wings are very susceptible to dents. I will not be using the snorkel for fording the Wharfe, however; the side currents are liable to tip the whole thing over, but, as it also has high up breathers on the diffs and gear box, it should be OK in flood water. Busy day yesterday. Making a load of logs to split (no pun intended) three ways. Someone called to collect a deer as arranged. A chap from Addingham called on his walk for a lift home with his logs. But on the way I had to drop off two chairs (see picture above) and a shoe rack for customers who live miles up a track on Barden Moor. We decided to meet over the wooden bridge over the Wharfe at The Cavendish Pavilion. It was like Check Point Charlie! Anyway, he was pleased with the two advance chairs and shoe rack. Short day off this week, I’m in Strid Saturday and Sunday for the Christmas rush for elves and deer. 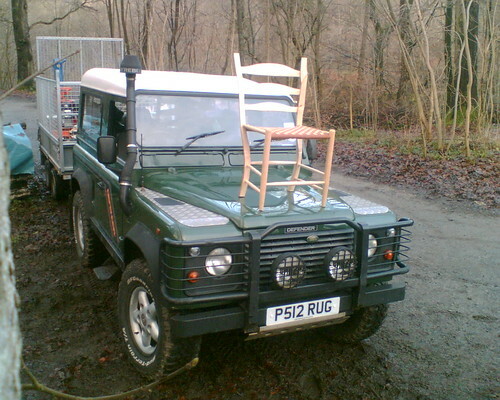 This entry was posted in Green woodwork and tagged chair, land rover, logs, shoe rack, snorkel by Flying Shavings. Bookmark the permalink.